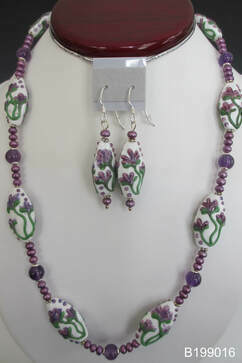 22' necklace and earring set: Necklace and earrings feature a ceramic beads with a flower motif, amethyst beads, small purple freshwater pearls with pewter findings and flower motif toggle and loop clasp. 25" necklace with a distinctive amethyst chunks and striped agate stones accented with a purple resin flower and pewter findings closed by a toggle and loop clasp. The matching earrings have sterling silver hooks. 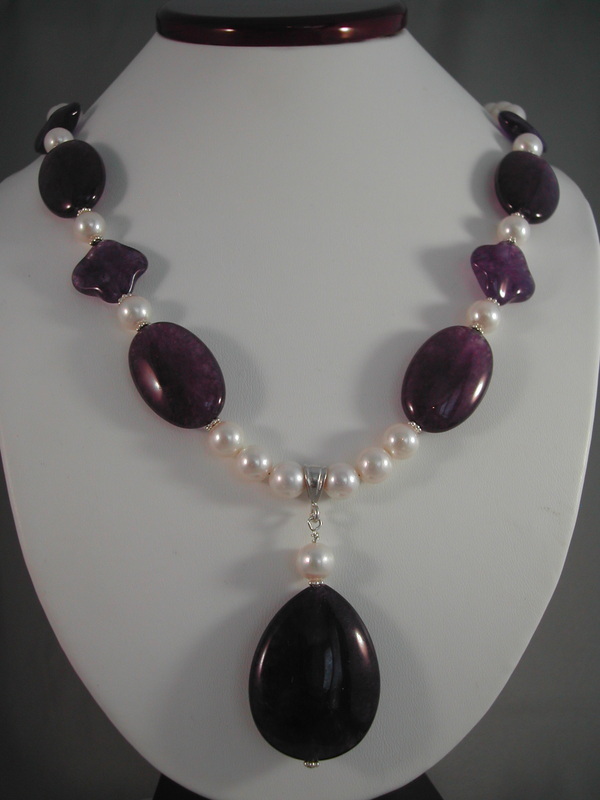 22" necklace and earring set includes: A large 39 mm teardrop amethyst stone pendant on a necklace with 30 x 20mm elliptical, 16 mm diamond-shaped wavy amethyst stones, 8 mm white freshwater pearls and 8 mm amethyst balls, sterling silver findings.